It wasn’t long ago that encryption projects were thwart with problems. The performance was terrible. Key management was a nightmare. Encryption was only implemented as a “must have” for compliance or national security. Around 10 years ago, performance started to be addressed with the introduction of AES acceleration in modern Intel processors. A new range of key management solutions started to appear to simplify encryption projects. Coupled with a “move to the cloud” the demand for encryption is now at an all-time high. But there is still one problem left to be solved. To perform encryption, even with hardware acceleration that AES-NI provides, encryption keys need to be memory resident. As such, the keys are vulnerable to attack. 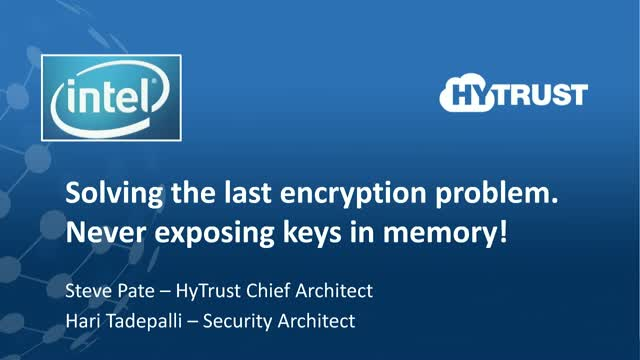 With the introduction of Intel QuickAssist and Key Protection Technology and, in conjunction with HyTrust DataControl, this webinar will introduce you to some new and exciting technology where encryption keys are never exposed in memory and high-performance encryption is performed by the QuickAssist hardware. We’ll also be exploring the use of SGX in conjunction with QuickAssist to build secure, distributed HSMs. Title: Solving the last encryption problem. Never exposing keys in memory!